CHERUB agents are highly trained, extremely talented and all under the age of seventeen. For official purposes, these agents do not exist. They are sent out on missions to spy on terrorists, hack into crucial documents, and gather intel on global threats all without gadgets or weapons. It is a highly dangerous job, but these agents have one crucial advantage: Adults never suspect that teens are spying on them. In Maximum Security, James's newest mission brings him to the sun-baked desert prison Arizona Max, home to 280 child criminals. One of them is the son of a weapons dealer who has been selling U.S. missiles to terrorists. If James can get the kid, CHERUB has a chance to stop the father. Getting into the prison is easy. Breaking out is the hard part. 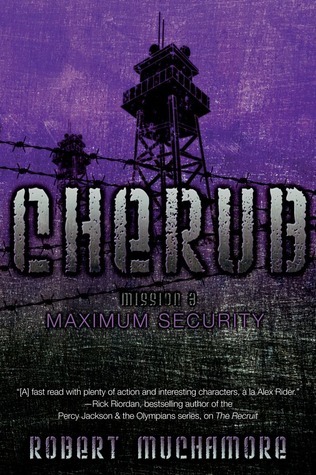 You can read my reviews for CHERUB books 1 & 2 here. Once you have, you'll see I looooove the Cherub series. Book 1 was by far the best, but I've really been enjoying the continuation of the series thus far. What's great about this series is that each mission is totally different and disconnected from the last. Therefore, content-wise, I have very little to say. As usual, fun, wild, fast-paced, and everything a Percy Jackson/ Maximum Ride fan will love. In this installment the stakes get higher, which is always good.